If it can’t sell customers on Windows, Microsoft’s Plan B has been to bring its services to other platforms. On Monday it did just that, porting Office to Android tablets made by Samsung, Dell, and others. For Samsung, the Office deal represents an expanded partnership with Microsoft. At Mobile World Congress, Samsung announced that it would pre-install OneNote, OneDrive and Skype to its Galaxy S6 and Galaxy S6 Edge phones. Samsung also essentially pre-announced the Office partnership with Microsoft, as an executive claimed it would be marketed as part of its KNOX security solution for phones and tablets. That’s partially true. Microsoft Word, Excel, PowerPoint, OneNote, OneDrive and Skype will be preinstalled on select Android tablets, both companies said Monday. Businesses that purchase devices through Samsung’s business-to-business sales channels will have access to three versions of Office 365—Business, Business Premium and Enterprise—coupled with Samsung’s KNOX security solution, Microsoft said. The bundle also includes a setup and support service from Samsung. 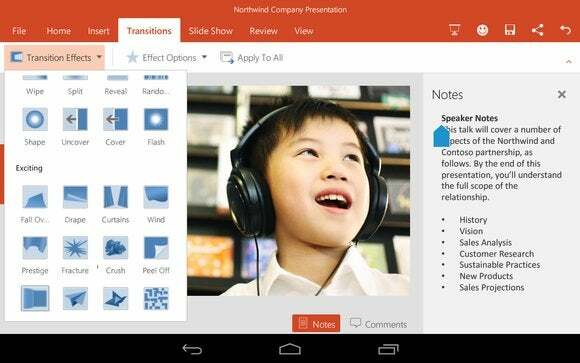 Why this matters: Most people will see Microsoft’s Office suite as a useful addition to an Android tablet. A one-year trial of Office 365 materially contributes to the value of the device (though we’re not sure whether Samsung and Dell will offer it). The flipside, however, is that Android users, long used to living without Office, may see its sudden appearance as bloatware, even if they can uninstall it. A little over a year ago, Satya Nadella took the CEO chair at Microsoft promising a “mobile first, cloud first” mission that would use software to tie devices together. Over time, Nadella has made clear that those devices don’t necessarily need to be powered by a Microsoft operating system. “For OEMs, these deals will increase the value of and enrich people’s experiences on Android devices,” Peggy Johnson, the executive vice president of business development for Microsoft, wrote in a blog post. According to Johnson, Microsoft is following its users, "addressing consumer demand for top services by making them already available on a device, instead of requiring consumers to download them separately." 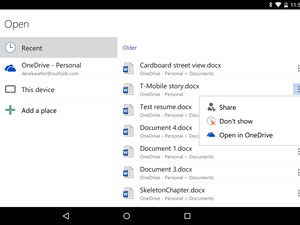 All will pre-install Word, Excel, PowerPoint, OneNote, OneDrive and Skype on Android devices coming to market later this year, Microsoft said. Dell said it would use Android for Work to secure corporate information, and presumably that means the other hardware makers will, too. Interestingly, a report on the XDA developer forums that surfaced recently says that Samsung is getting rid off most of the annoying “Samsung” and “Galaxy”-branded apps on the S6 and S6 Edge, a response to customers who didn’t have any use for the apps and couldn’t uninstall them. Some of the apps now include a “Delete” option next to them, according to the report. Following the Superfish debacle at Lenovo, PCWorld dug into the software preloaded on many retail PCs, determining the worst PC makers for shipping bloatware. By preloading Office, some will undoubtedly say that Microsoft, Dell, Samsung, and the other hardware makers are doing exactly the same thing. Fortunately, Microsoft says that you will be able to uninstall the preinstalled Office apps, making them, at worst, an annoyance. "Yes, customers may delete the pre-installed apps if they would like," Microsoft said in a statement. "However, we’ve seen overwhelmingly positive feedback from customers as we’ve brought Office apps to all platforms. Over a billion people around the world use Office and they want a seamless experience across devices and platforms." Updated at 3:32 PM with additional information from Dell.